It was Saturday, the evening before Mothering Sunday and I was chatting to my husband as we ate dinner. We were discussing the Mothers’ Day tradition of handing out posies of flowers to all women at church. I was thinking about those women sitting in church who desperately want to be a mother but aren’t. Or those who are grieving the death of their own mother. “I think that these things are difficult because they highlight to us the world’s romantic ideals of motherhood and families. But our lives are not romantic ideals, they are real and messed up. “Church should be the safe place to be honest about these sadnesses, not the place where you have to smile and pretend a bunch of flowers makes everything okay. If I were struggling with infertility or bereavement, I think I just wouldn’t show up that day. There’s just no way that I’d even come,” I went on. “And after all,” (and this was my piece de resistance, the indisputable truth), “the whole point of Mothering Sunday wasn’t to make a fuss of mothers. It was a tradition where the smaller ‘daughter churches’ went back to the local cathedral, the ‘mother church’. It wasn’t supposed to be a festival celebrating mothers, or even the nuclear family. Jon spooned some pasta into our boy’s mouth and paused. “Some people like to get a bunch of flowers,” he replied. I sighed. I guess it’s hard, even for vicars, to challenge tradition. Later that evening, a while after we had finished the topic and had been talking about something else, Jon turned to me. “You know what?” he asked, in a slightly defensive tone. “What?” I replied guardedly, waiting to be corrected about something I had said on some topic or other. “I think we should celebrate you tomorrow anyway,” he said. I was overcome by the flood of emotion that unexpectedly burst through me. I sobbed. I was reeling; I had to sit down on the bed. I cried and cried. I didn’t realise till that moment: I wanted to be celebrated. Because – because – Mothers’ Day is a day when mothers who have been hardworking get a break. Dads who feel grateful and a little bit guilty take their wives out for lunch to say they’re thankful for all the cooking they do. Children thank their Mums for all they do for them. Jon can’t bring me breakfast in bed as a treat – he already does that every day. He does it because he has to, because I’m not well enough to do it myself or to eat breakfast downstairs. He already does all the cooking – and everything else in the house as well. He changes the nappies, he dresses the baby – it’s all him. It feels like he’s father and mother. I wept at the kindness of a man who was not looking to be repaid for all he did but who loved to carry on giving. I wept at the kindness of a man who reflects the character of the God he worships. And so it happened that on Mothers’ Day this year I was celebrated, despite my protestations. I was not celebrated for the things that I do but for the fact that I am a mother and that I am loved. 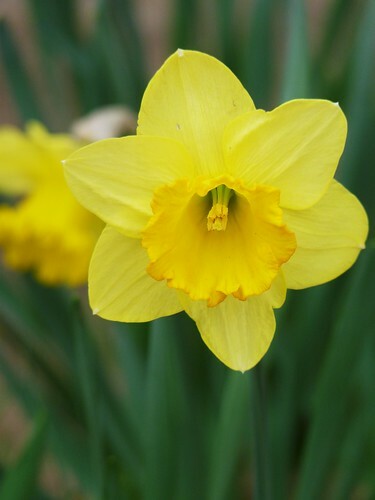 And it was kinda nice to have my boy bounce on my bed and hand me a single daffodil, given to him by his father. I don’t really know now what I think about the pros and cons of handing out flowers to women in church on Mothering Sunday. It’s hard enough to navigate my own complex emotional responses, let alone having to second-guess what others might be feeling on these occasions. But I do know one thing: it is an amazing feeling to be celebrated, just for who you are. I hope everyone gets to experience that. How do you feel about Mothering Sunday and its traditions? Who in your life celebrates you for being you? Wow – I am so glad I stopped by here today. This is a very thought provoking post! This was the first mothering sunday that i had spent in church with my husband and my two kids. I was very blessed to have my hubby there with me and overwhelmed to have been cherished in such a way. A bunch of flowers soon wither but that memory of having my family celebrate with me i will hold in my heart forever. I have friends whose mother had passed away at a tender age of 33 and she posted on her facebook page a picture of her mothers grave and the flowers she laid on them. I am here and my kids can show me love and appreciation in any way they wish – even if it is a bunch of flowers. My friend still celebrates and shows love to her mother at her graveside. My heart and my prayers have been with that young lady and her siblings as they reflect on the years they have not had with their mum and the things they would have said to her. I also have friends who have been unable to conceive but have gone on to adopt children. I can understand all aspects of what you are saying here and it is a tricky one, but i am glad my mum is still here so i can show her the respect, love and appreciation she deserves for all she has done in giving me the best start in life, my father wasnt around for 25 years of my life and my mum really did all the parenting by herself and she ought to be cherished and pampered. Having said that its a tricky one, i must say that i look at some of the ladies in church as being adoptive mums and nannies, yes i have grown quite fond of some of them! The older generation whether they have kids or not, have something of themselves to pass onto the younger generation, it may be some advice, guidance or they may simply give you a hug, all of which a mum or dad would do! and isnt that what church is – extended family? thats how i view my family at St Pancras – my extended family of brothers, sisters, mums, dads, nannies and grandads, in my own way i love them all and cherish them all too (including you)! I hadn’t realised before the biblical intent of mothering sunday and that gives me pause for thought moments and i think it is a good idea to celebrate with other churches, but why have it only on Mothering Sunday, why not make this a regular thing especially as theres a unity service on the Hoe again this year (can check out the details on ctip website, thats churches together in Plymouth. I love this post Tanya, its very heartfelt and emotional and Jons view of you as a mother and a woman is beautiful, it brought tears to my eyes! You are a wonderful mother and you ought to be celebrated, its good to have our sons treat us as we would want them to treat their future spouses! Thank you so much for your kind words and for sharing your experience. It sounds like it was a really special experience for you this year and I’m so thankful that you able to be there with your whole family. It’s great that you can also honour your Mum and show her appreciation for loving you. I think it’s great when Christians get together in a bigger group every once in a while (like annual conferences, united services etc). One problem is that they tend to meet in outdoor spaces, which is always a risky thing to do in rainy England…! Thanks so much for taking the time to comment. This can be a really hard one. As someone who has lost a child, who knows friends struggling deeply with their inability to conceive, for young women longing to marry and enter a covenantal relationship within which to have children but struggling to find a suitable Christian man, there is a very high risk of injuring emotions by the public gift of flowers. I agree with RiaD, that we can’t not honour people because it will make others feel sad. I know the roots of ‘Mothering Sunday’ but our church emphasised not just mothers, but women in general (we can be ‘mothers’ even if we don’t have our own biological children). Peter led Reuben to the front to collect a daffodil for me (yes, I was on the verge of tears, remembering all my boys, ALL of them..), but after that I took him up to collect more flowers to offer to the female students in our church – it was noticeable that all the flowers were being distributed to the mums (because their children were giving them a narcissus..) but not to single, childless women (the students were all sitting on one side of the church, and there was a distinct absence of yellow flowers amongst them..). I remember being a student and being bypassed on more than a few occasions because I did not have my own children; but also remember feeling the glow of being honoured as a woman when a stranger gave me a mini-bouquet. In this day and age where women feel the church is in some cases neglecting and overlooking them and their role, why not have one day in the calendar that honours mothers and women in general?! Thanks so much for this, Gayle, and for sharing your own experience of Mothering Sunday. It sounds like it was a profoundly moving experience for you, and I guess it will have been for others as well. I don’t know whether my question should be: ‘should we do this ritual or not?’ or whether it should be (as a friend said on Twitter), ‘how do we best handle the rituals we have inherited?’ If it is handled well, then I suspect that the problems that the ritual itself raises are minimised. It’s an interesting suggestion to intentionally ‘evolve’ these inherited traditions into something else. My initial thought was to ‘return’ to the original tradition of Mothering Sunday, and therefore lose the emphasis on mothers altogether as we think about the larger church family. But I think most people would feel they are ‘losing’ rather than ‘gaining’ to do this, and I guess it would be better to redefine the day in order to make it feel like more people are ‘gaining’ rather than ‘losing’. One lady stood up in church yesterday and thanked everyone for the lovely bunch of flowers she had, and said how nice it was to receive it. I think she would be sad to miss out on the ritual of handing out flowers to women. I wonder if there is a way of redefining, evolving…? It’s certainly one to ponder. I actually think it’s important to celebrate Mothering Sunday in some way – I want to teach Anna and Issac that their mummy is worth celebrating. But it isn’t about the jobs she does, the cooking, the cleaning (although we are thankful for that to) but no, motherhood in itself is worth celebrating. Mothers are a gift to their children and motherhood is a wonderful gift too. That is enough – and so Jon is sooo right to celebrate you – you are a mother, the best you can be and that has nothing to do with physical or mental strength and everything to do with love. We say thank you to God for loving us, but forget to say thank you to those others who love us in spite of ourselves – as society would say ‘only their own mother could love them’. That is why it’s worth celebrating, not only as a thanks to God but as part of our ‘honouring’ to our mothers and just to say thank you for being my mum. If you break it down and say that I should cook to give K a break because she always does it, that I should give her a rest (and I’m not saying that is necessarily a bad thing in itself) we make motherhood about doing stuff and not about being a mother – two very different things. So what I want to say to you is that you are a terrific mother, a brilliant one, you love, nurture, pray for, pray with, protect, bring up, give of yourself – even when there is a cost to you in a way that only a great Mummy can – and you need to remember that, (and be told it perhaps). As for flowers in church, I think it goes back to motherhood being a gift of God, and therefore is something to celebrate. It is a blessing and so we shouldn’t hide it away – in the same way that we shouldn’t hide the gift of prophesy in case those who are not called to be prophets get upset about it. So should the church celebrate mothers and motherhood? Absolutely – and even more so as society devalues it more and more and tells us that mothers should not be mothers full time, because it’s not a worthy thing to be. If the church can’t celebrate it what then? I always find your comments so encouraging – thank you! You’re right, of course, that being a Mum is not about doing but being and loving. (As is being a Christian…) It’s helpful to expose my subconscious thought patterns on these things. And it’s definitely an important point (as Ria D said above) that society is increasingly devaluing the time spent Mothering, so it is valuable to provide a corrective for this. It was I who had to do the 3 min talk on Sunday and hand out the flowers. I sat there thinking about what I was going to say…and nothing came to mind! I looked around my wonderful Church Family, and felt totally lost for words. For the Mums who had lost children, for the children who had lost their Mum. For the ladies who longed for children…for these people…I HAD NO WORDS! I struggled! I turned to Jon, “I have no idea how to handle this.” He (as always) gave me some words. I kept it simple. I read a poem for my Mum and then handed out the flowers. I stood looking around and realised I should have said more! I wanted to tell those ladies who longed for children, that they felt like Mothers to me. That the love they show me reflects Motherly love. I wanted tell those who had no Mum, that I loved them so much, it was like they were my own children. The truth is, the church family…is a family. We are all Mothers, sisters and daughters to each other, and maybe next year, that should be said! As a Mum, I don’t need to be handed a posy. The love I receive from my two children is enough. But you know, those posies were made by the ladies of our church, some who have no children or are grieving their own kids. Every bloom is put together with a prayer that it would be a blessing to another. So, maybe its worth keeping the tradition, just for that! As for you….Who ever said being a Mum was cooking and cleaning? Those tasks don’t mean anything to your boy. All he cares about is how much you love him. Your incredible, beautiful, indescribable love for your child is what you should be celebrated for. Nothing else!! As for Jon, his care for both of you is rewarded daily, in the smiles and love he receives in return. Its not what do you do, its how you love, and you love very well indeed. I wanted to do something nice for both my parents this Mother’s Day as it was my dad’s first one without his mum and my mum’s second one without hers. Days like Mothering Sunday are always hard. I am not a mum but I do enjoy getting some flowers on Mother’s Day anyway. It is nice to honour the women of the church, not just those with children. Thanks Mela – I’m really glad to hear that you enjoy getting flowers on Mothers’ Day. I always imagine that other people will be feeling awkward or resentful, so it is good to hear that there are plenty of people who really like the fact that it honours women in the church. And as Jon said, it is always nice to get flowers! It’s a very hard one that. If we really want get back to it’s history, Mothers Day, had far more pagan roots, that we perhaps care to admit. I think it is hugely important to create a culture of honour within the church body. As a mum in society, most of the time I feel very undervalued. It is some what of a conversation killer to tell someone you are a SAHM. No networking, no chats about work or people you may have in common. I deliberately gave up a career, and a life of my own, because I felt called to be at home with my kids (something my husband supports, but perhaps doesn’t value). Given that for many early years my husband wouldn’t really do Mother’s Day, because I wasn’t his mum. This left me feeling very undervalued. Given that my children did not then have someone showing them how to honour their mother, I found it hugely touching when somebody else did, whether that be their grandparents, the church or a stranger in the street making a passing remark about how lucky they were. I don’t know that it is ever a good idea, to not honour someone (or a group of people) because of somebody else’s wounds. Nor do I think those wounds should be ignored. Flowers can just become a symbol, a symbol of hope, of promise, of loss of better days, of rejoicing. Perhaps it is not the act that needs to be changed, but the context. To explain that Mothering Sunday holds different meanings for everyone, and to release people to seek the Lord’s word to them in this symbolism. For some it may be the only honour they receive on that day for their mothering, for others, it may remind them of babies lost, hope for the future, or precious memories of days gone by. It allows us to honour those within our midst who are spiritual mothers, the women who graciously and lovingly give their lives to mentoring the younger women, running bible studies, coming along side them, praying faithfully, delivering meals. Or simply an act of grace, a moment to accept the love and grace of those who love us, just because they love us…. not because of what we do, but because of who we are (mother or not). That sounds like Christ’s love, the best kind. We will always have the wounded and broken amongst us, if we are doing things right as a Body, and while we should not seek to cause offense, neither should we withhold honour from those we want to bless. Thanks so much for this thoughtful and helpful response. It is good to be reminded that there are many Mums that sacrifice much and are not honoured or respected sufficiently by society for these sacrifices. ‘I don’t know that it is ever a good idea not to honour someone because of somebody else’s wounds.’ – this is a really interesting thought, and I think you definitely have a case with the ‘there will always be poor among you’ argument. I like the idea of somehow redefining and hoping to reclaim different meanings for individuals. I don’t know if this is always possible, but it would definitely be something to aim for…? I still feel a bit embarrassed at the flower-giving moment in church! It’s lovely for some, but weird for many isn’t it? Thank you, as ever for your kindred-spirit encouragements! Leave a Reply to GayleO Click here to cancel reply.